The wide tow winches can be delivered with different configurations. 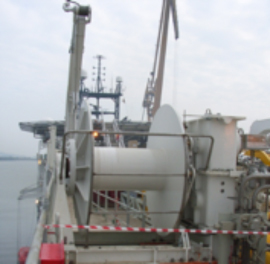 The winches can be delivered with automatic spooling device. The pull capacity of the winches is typical between 10– 100 tons. 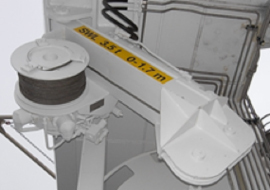 The winches can be delivered with static and dynamic tension and length monitoring. 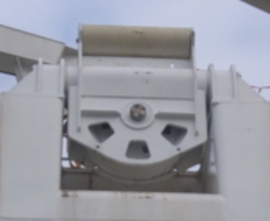 The winches have a compact design. Option can be delivered with dynamic towing function , for tension control. We deliver all types of sheaves and fairleads. The fairleads can be special made for the special rope. The blocks can be delivered with line load monitoring system that calculates the actual line force. The large diameter special sheave is installed in a balanced hinge. We deliver handling system for door handing. This includes davits with auxiliary winch and telescopic supports. The system is synchronized for operation with the other system onboard. We deliver passive tensioner for static towing operations to reduce peak loads. Portable spooling racks for streamer and leadin cable drums. The units can be delivered automatic tension system.